Solid Construction with Smart Craftmanship You will be surprised at its durability, this pencil organizer is made of premium quality oxford, strong zipper will withstand heavy use, you can own this for long time. Handy Design and Compact Size: This colored pencil case will offer a great protection to your precious collection. All 160 pencils are stored and organized in this compact case. Handy strap makes it geat to traveling with. Item Size: 8.46 x 9.84 x 3.15 Inches. Pencil Case with Compartments: Each sleeve holds 20 pencils easily which makes it easy to organize and group pencils by color family, you have access to ALL the pages and 160 colors when you unzip it. A full zipper closure allows you to lay it flat for easy access. 160 Individual Slots: It actually has 160 different slots, so each pencil has its own place, elastic strap holds each pencil securely and prevent them from falling out or being stepped on. Perfect Holder for Various Pencils: This colored pencil holder will hold up to 160 standard pencils perfectly, apply to Prismacolor colored pencils, Crayons, Raffine Marco Pencils,watercolor pencils, Blender Pencils, Sketch Pencils and many more. 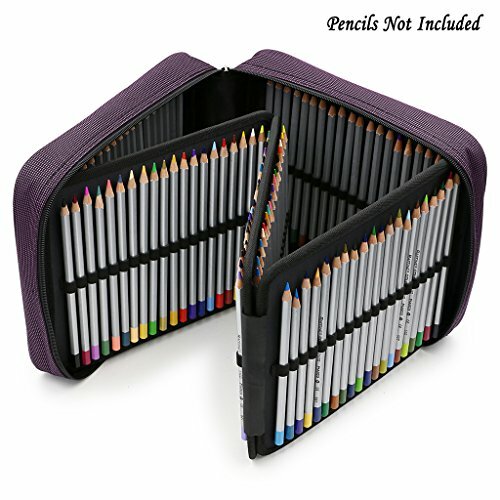 A must have pencil organizer for artists who have tons of pencils. Excellent Craftmanship: It's an extremely sturdy pencil bag, durable oxford material and strong zipper will withstand heavy use, you can own this 160 pencil case for a long period.